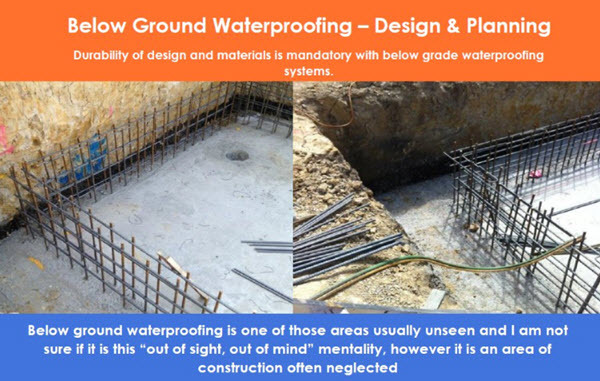 Below ground waterproofing is as important as your foundations supporting the entire structure. Without the combination of sound footings and waterproof structures a building will deteriorate rapidly. Below grade systems are often inaccessible for repairs and extremely costly if modifications or rectifications are necessary at a future date. Positive-side waterproofing systems are post-applied to the surface of the substrate directly exposed to moisture, typically the exterior side of the foundation wall. The traditional plastic barrier used for under slab protection is a moisture barrier and is NOT a waterproof membrane. Waterproofing Membranes installed under concrete slabs must provide permanent vapour, gas, chemical & water protection. Liquid Applied Membranes are particularly suitable for gas vapour barriers for mitigating methane & VOC intrusion. Liquid Applied Waterproofing provides a seamless and flexible membrane that will also move with the concrete foundations. This means there are no JOINS or SEAMS - which are often areas of potential weakness due to possibility of tears during construction & over time. Spray apply Liquid Rubber Membranes cure to form a continuous seamless barrier providing waterproof protection horizontally, vertically up walls and around penetrations, pipes and upturns. Liquid Membranes cure to form a durable barrier providing permanent water protection. 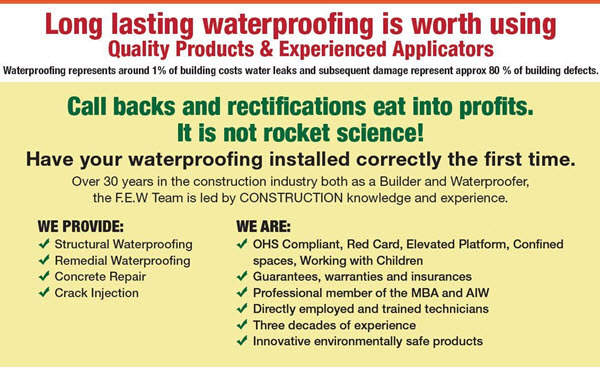 Liquid Waterproofing Systems are engineered for below slab construction. The Membrane bonds integrally to poured concrete for use below slabs or basement walls - both horizontally & vertically.